Pink referee whistles and lanyards make great breast cancer awareness ideas for wrestling referees. 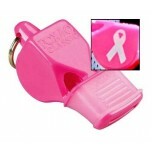 Purchase a whistle today, and we'll donate a portion of the proceeds to the American Cancer Society. Worked well for crew. No issues.